Mobilink P60 - Performance uninterrupted! Epson's compact, cost effective Mobilink™ wireless mobile printer is designed to meet the needs of both retail and hospitality for high-speed, mobile, thermal receipt printing. Your current TM-T88 series applications are instantly compatible with Mobilink. And unlike other wireless mobile printers with an average battery life of 2-3 hours, the Mobilink features an industry-leading battery life of up to 20 hours. Best suited for: Retail, Food service, Logistics. This wireless printer is perfect for label or receipt printing and is the fastest in class. Clear, crisp printing, drop-in paper loading and a ruggedized design. 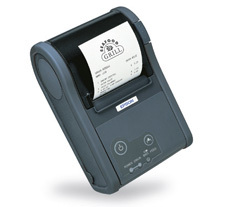 The receipt printer model includes an auto cutter and the label printer includes a label peeler. The Mobilink features an industry-leading battery life of up to 10 hours with 802.11g models and up to 20 hours with Bluetooth models. Flexible, high-speed printing, network support and superior reliability with an extremely low total cost of ownership.